8- Environmental audit of Coal Mines operated by Coal India Limited (CIL) and Subsidiary Coal Companies funded by Coal India Limited (CIL). Moreover, with passage of time this division has developed liaison with Govt. expert institutions like AHEC, IIT Roorkee, DCFR, Bhimtal; SACON, Coimbatore; WII, Dehradun, NEERI, Nagpur; NRSC, Hyderabad; CIMFR, Ranchi, Xavier Institute of Social Sciences, Ranchi for execution of consultancy services in Consortium mode. A pool of multidisciplinary domain experts have also been identified, whom services are utilized on case to case basis as per the requirement. 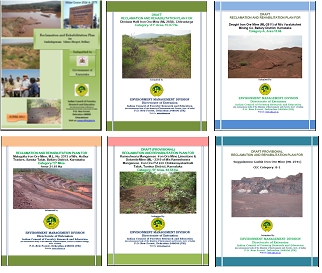 Environmental Policy analysis with respect to green aspect of environment have been carried out for more than 100 iron ore mining projects in Karnataka and a numbers of coal mines of Coal India Ltd. and suitable remadial measures have been suggested. 2- A Memorandum of Understanding (MoU) has been signed between Indian Council of Forestry Research and Education (ICFRE) and National Thermal Power Corporation (NTPC), Noida for Monitoring of its Accelerated Afforestation programme of Plantation of 10 Million Trees – in Seven Different States. 4- Preparation of wild life conservation plan.for scheduled flora and fauna species. 5- Preparation of wild life conservation plan.including endangered species and comprehensive study of the impact on the wildlife for Malachua Opencast coal mining.Monitor Lizard. 1- State Forest Department, Rajasthan:Evaluation of forest protection, management and developmental activities under Compensatory Afforestation and Management Authority in Rajasthan. 4- Rajasthan High Court, Jodhpur: Designing development and performance of urban forestry model for new campus of Rajasthan High Court, Jodhpur by Rajasthan High Court. 1- Integrated ecosystem approach (IEM) to rehabilitate degraded arid and semi-arid land of western India for combating desertification' for GEF-UNDP. 2- EIA of the project 'Integrated Watershed Development Project in Sunel Watershed of Pirawa Panchyat Samiti District Jhalawar, Rajasthan. 3- Evaluation of the plantation work on Gaurav path developed by the Jodhpur Development Authority on 100% physical verification basis. 5- IIM, Udaipur: Preparation of baseline data on vegetation diversity and soil for IIM Udaipur Campus. 6- IIT, Jodhpur: Survey and characterization of soils &vegetation in the proposed land for IIT Rajasthan on Jodhpur – Nagaur Road, SFD, Rajasthan (Project document for erection of mega-shelterbelts in Western Rajasthan). 1- Studies on Environmental Impact Assessment (EIA) and Preparation of Environmental Management Plan for Nakthan Hydroelectric Project (400 MW), District Kullu, Himachal Pradesh. This consultancy was mainly assigned to ICFRE, Dehra Dun by M/s Himachal Pradesh Power Corporation Limited. ICFRE is taking up this assignment in collaboration with HFRI, Shimla. Field studies pertaining to flora, fauna and socioeconomics were taken up by HFRI and reports submitted to ICFRE accordingly. 2- Studies on Environment Impact Assessment (EIA) and Preparation of Environment Management Plan for Thana-Plaun Hydroelectric Project (141 MW), District Hamirpur, Himachal Pradesh. This consultancy was mainly assigned to ICFRE, Dehra Dun by M/s Himachal Pradesh Power Corporation Limited during February 2010. ICFRE is taking up this assignment in collaboration with HFRI, Shimla. Field studies pertaining to flora, fauna and socioeconomics were taken up by HFRI and reports submitted to ICFRE accordingly. 3- Studies on Environment Impact Assessment (EIA) and Preparation of Environment Management Plan for Beri-Nichli Hydroelectric Project (78 MW), District Hamirpur, Himachal Pradesh. 4- Studies on Environment Impact Assessment (EIA) and Preparation of Environment Management Plan for Surgani – Sundla Hydroelectric Project (42 MW), District Chamba, Himachal Pradesh. This consultancy was mainly assigned to ICFRE, Dehra Dun by M/s Himachal Pradesh Power Corporation Limited during February 2010. ICFRE is taking up this assignment in collaboration with HFRI, Shimla. Data pertaining to floristics and socioeconomics was collected, analyzed and report prepared by HFRI and submitted to the ICFRE Headquarters for its finalization and inclusion in the final report. 5- Cumulative Environment Impact Assessment Studies (CEIAS) for Sutlej Basin in Himachal Pradesh. Directorate of Energy, Government of Himachal Pradesh, Shanti Bhawan, New Shimla, Shimla-171 009 (H.P.) has assigned the task of taking up of studies on "Cumulative Environment Impact Assessment Studies (CEIAS) for Sutlej Basin in Himachal Pradesh" ICFRE is taking up this work through HFRI, Shimla. Data pertaining to floristics and socioeconomics was collected, analyzed and report prepared by HFRI and submitted to the ICFRE Headquarters for its finalization and inclusion in the final report. Himachal Pradesh Forest Department has assigned the task of monitoring and evaluation of plantations raised under H.P. State CAMPA. A detailed comprehensive monitoring of the plantations were carried out as per the standard procedure and Division-wise and State Report of the monitoring were submitted is being finalized. 1- Monitoring of Plantations Raised under H.P. State CAMPA Himachal Pradesh Forest Department has assigned the task of monitoring and evaluation of plantations raised under H.P. State CAMPA during January 2015. A detailed comprehensive monitoring of the plantations were carried out as per the standard procedure and Division-wise and State Report of the monitoring were submitted to Himachal Pradesh Forest Department. 1- Enumeration, Geotagging and Inventorization of Tree-Biodiversity at NTPC-RSTPS. 2- NTPC Accelerated Afforestation Programme of 10 million trees – in seven different states. 2- Environmental auditing of open cast coal mines of Coal India Ltd.
1- RFRI, Jorhat executed Consultancy Project entitled “Preparation of Biodiversity Management Plan, Regional Wildlife Plan and Carrying Capacity Study for the Makum Coal Fields in Assam", funded by Northeastern Coalfields Ltd. (NEC), Margherita, Assam. 1- ARCBR submitted a report on the Lichen Diversity of Yamuna and Tons River Valley in Uttarakhand as a part CEIA study carried out by ICFRE. 2- ARCBR submitted a report on the Lichen Diversity of Bhutan as a part CEIA study carried out by ICFRE. 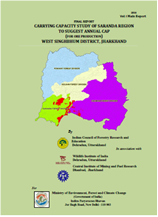 3- ARCBR Aizawl Mizoram submitted a report on Lichen and higher plants diversity in North East coal fields Assam to RFRI under a consultancy project entitled “Preparation of Biodiversity Management Plan, Regional Wildlife Plan and Carrying Capacity Study for the Makum Coal Fields in Assam”.